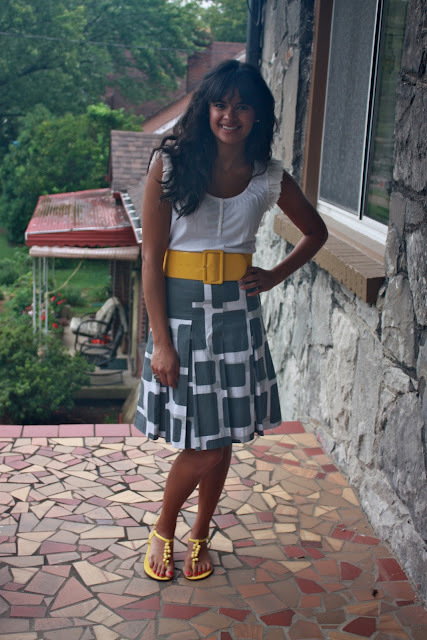 now you're just a skirt that I used to know | Priya the Blog | life & style in Nashville & beyond! Not sure exactly when I got this skirt, but I do remember it was in high-school, pre-driver's license, because I made my older brother take me to get it. I shouldn't even say "made" because I luckily have four brothers who actually enjoy shopping. He said, "Yeah, I like it." and I loved it. Definitely a pre-meditated purchase. Now I'm not sure, it's been hanging in my closet all summer. I still love the print, but I think the cut is a little weird. It goes up high, needed a belt, and will probably plague me with adjustments all day (Editors Note: As of 12:43 pm, this outfit is a pain!). I spent this weekend consoling myself over the fact that I simply cannot have all my clothes in my closet. About half of them must go in our basement, lest I forfeit my sanity. I must say, my closet is SO neat (I am tempted to even post a picture. I am a nerd.) and I will have to select and switch-out things that I want to wear. Also, welcome to my front porch! My new (old) house is loaded with outfit photo-ops galore. The fashion blogger inside of me says yay! In case you were wondering where I'll be tonight, I'll be in Physics lab aka my Twitter feed will be overflowing. Once again I will wear an outfit to lab not appropriate for gravity and measurements, but I have to keep myself interested somehow! Don't you love short weeks? I am confused, but excited nonetheless! Thanks for reading! Way cute! And I LOVE your front porch! love the skirt - but yes, my pet peeve is a cute outfit that causes me so much frustration from twisting/turning/tucking it all day! Yay for a photo-op-able front porch though! I love this outfit! Grey and yellow is one of my all-time favorite color combinations (if you couldn't tell from my blog, haha). Usually, I miss being in school, but I definitely do not miss night time science labs! Your porch is also awesome! Hope you are having a wonderful day and enjoy the short (but yes, confusing)week! I think the print looks often! I love finding new uses for old clothing :) love how you mixed in the bright yellow with the belt and the shoes! also, your hair looks perfect. You are so pretty girl!! Love your hair. That skirt is super cute. Funny that you remember all the details surrounding when you bought it. this is such a cute outfit <3 again you look perfect as always! 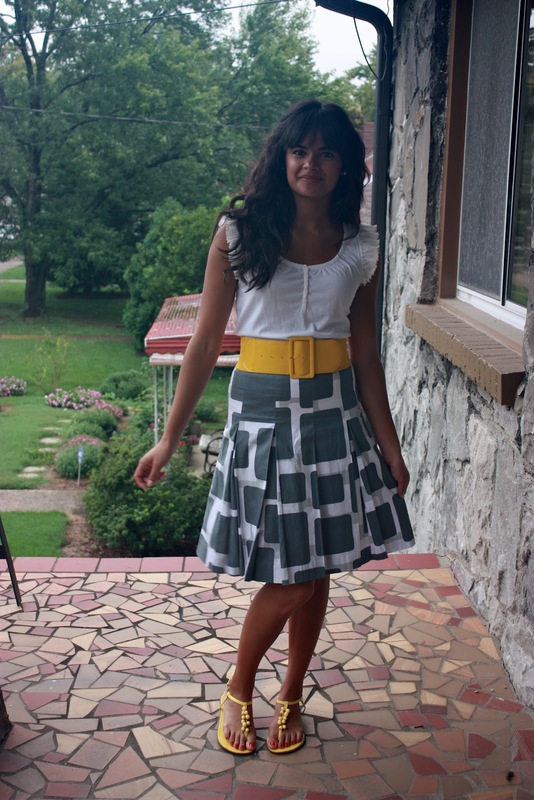 love the skirt and the story! and i love the title haha :) and the belt and the sandals are soo cute and yellow! Thank you Steph! I love it too, I'd like to get some furniture and plants out there! Oh gosh, I hate that. I was quite happy to take it off at the end of the day! Thanks for your comment Jessica! Grey and yellow is super classy! Lab is the bane of my existence. Thanks so much Hannah! Cute look! Loving how you added the yellow belt! Thanks! 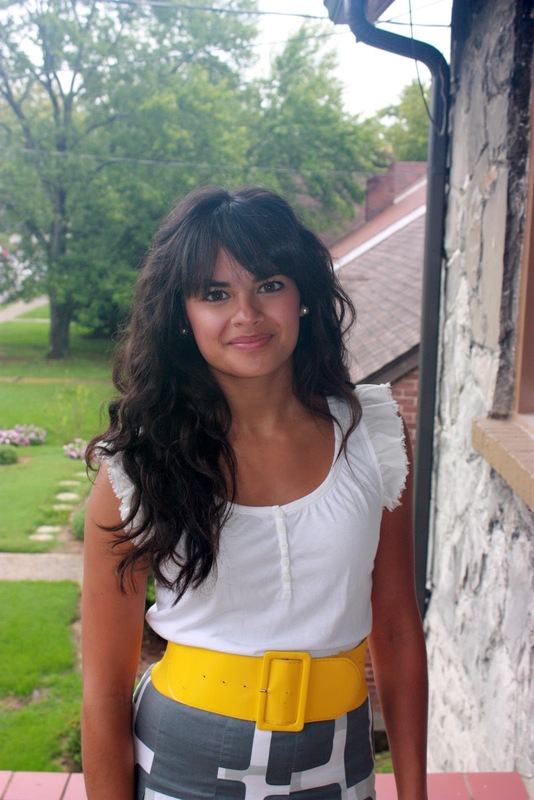 I would have liked to wear yellow flats more...but those don't exist in my wardrobe! Glad you like it, thanks for your comment! Oh gosh Kelly, you're too sweet, thank you! My hair was still wet from my shower the night before! I usually remember details of getting my clothes, is that weird? Thanks Jessi! Ha thanks Marie! Maybe I'll get a picture of that up here! Thanks for coming by Annie! Thank you so much Giovanna! Alexa you're too kind! Thank you for your sweet words! Great skirt! Pre-meditated purchases are the best, you look forward to them and you never regret 'em! Thanks Jenny! I did love this skirt so I'm just trying to figure out if I still love it. But the votes are unanimous! Thank you Miss Doyle! The yellow was a fun pop, and fun to change out of too! love the color combination! you look gorgeous! Thank you so much! I'm glad you like it! & thanks for coming by!